A super light version of the deeper ’full volume’ Shockbed, this high performance footbed is also made of lighter material. The Pro Am cupsole is a classically styled outsole with external stitching around the toe and heel for durability. It also features direct cushioning by accommodating a deep Drop in Shockbed, directly beneath the foot, and provides plenty of grip with a combination of Globe's S-Trac and ’broken herringbone’ patterns on the bottom. The Empire is a cupsole skate shoe with classic proportions and welded rubber stripes. It features a Nitrolite™ drop in Shockbed™ and Pro Am rubber cupsole. Now available in Mark Appleyard's signature colourway. 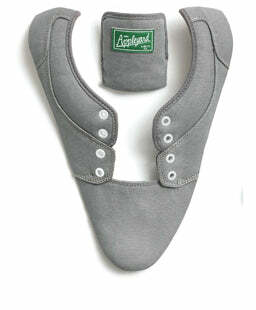 The Empire Tobacco/Gum by Mark Appleyard has a shaved suede/canvas/mesh upper.